Perhaps it is only wishful thinking. In fact, I'm sure it is, but this rainbow was beautiful after the big December storm - it was like a ray of hope. 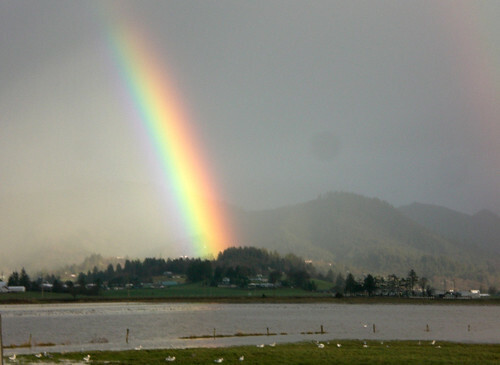 Just south of Tillamook, across a flooded field, a double rainbow illuminates a shattered land as seagulls, worn out from the great storm, rest in the distant foreground. We were without electricity for over a week. Some are still out. I hope this doesn't happen again for quite a while. I'm reading: A Ray Of Hope (Photo)Tweet this!